Founder of Slow Art, Phil Terry, began this project in the summer of 2009 to encourage people to spend about ten minutes looking at fewer artworks. 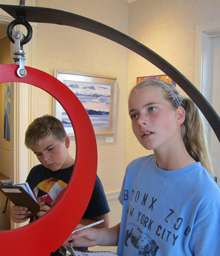 Slow down and enjoy the artwork of the annual Young at Art Exhibition. Visit MMoA with a young person and enjoy the adventure in our galleries that is our Eye Spy game, a scavenger hunt for objects hidden within the art. All participants receive a small museum prize. For more information on Phil Terry’s Slow Art Day project visit his website.